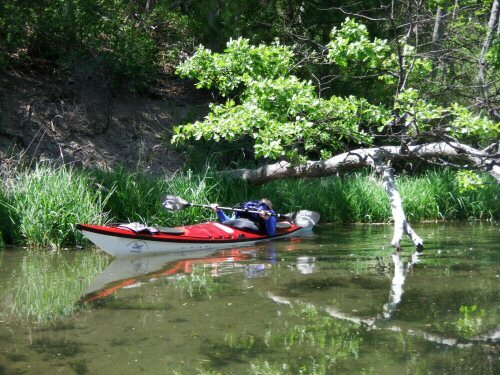 Article by Alex Colvin 05/27/15 — As the Pit River flows through eastern Shasta County, it is fed by the springs and streams of Fall River Valley and Hat Creek, creating numerous delightful locations for flatwater kayaking. Ahjumawi State Park, Baum Lake, Lake Britton, and selected areas of the Pit River around Hwy. 299 provide opportunities to experience natural beauty and wildlife while paddling serenely over the water. Deer, raccoons, coyote, otters, muskrat, and beaver thrive in the area. Bald eagles, osprey, and a variety of hawks soar above. American pelicans, egrets, great blue heron, grebes, geese, and ducks frequent the waters. The area offers incredible views of the Cascades, including Mt. Shasta and Mt. Lassen. Ahjumawi is a word from the language of the Pit River Native Americans who inhabit the area. It means “Where the waters come together.” Water from the snowmelt of Medicine Lake Volcano forms one of the largest systems of underground springs in the country. These springs feed over a billion gallons of water a day into Eastman Lake, Big Lake, Tule River, Ja-She Creek, Lava Creek, and Fall River. 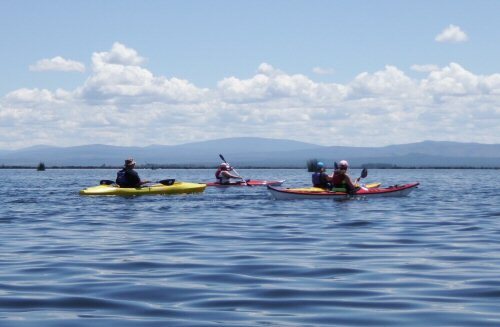 According to Donna Sylvester, certified Kayak instructor and owner of Eagle Eyes Kayak, “Spring and early summer is the best time to Kayak, especially on Lake Britton and Ahjumawi State Park. Baum Lake is great anytime!” Sylvester instructs and guides kayakers on waterways in the Pit River area. She has 21 kayaks, so she can provide a kayak tailored to the skill, safety, and comfort of each person. For visitors to the area who want to kayak but don’t need a guide, she provides rentals. To learn more about Eagle Eyes Kayak click here.